In the opening scene of Steve Barron's 1993 film Coneheads, the US National Guard is confused by a spaceship and shoots at it, sending the craft into the waters of Upper New York Bay. 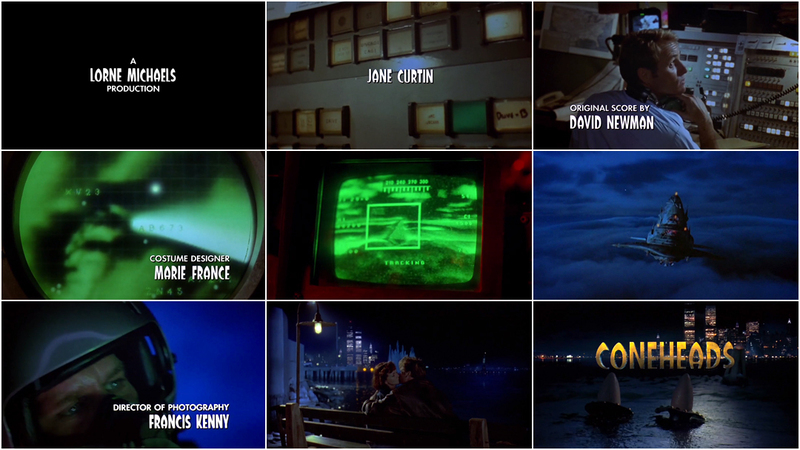 The titles, designed by Nina Saxon and featuring music composed by David Newman, set the tone of the film in an immediate and simple way. 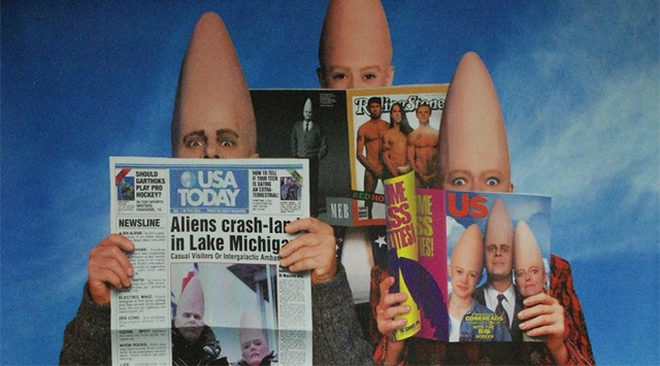 Superimposed on the live-action sequence is a curious set of lettering, a custom Coneheads typeface with rotund and elongated upper sections. The typeface, like Beldar and his life mate Prymaat, is both friendly and strange, taking the familiar and stretching it beyond its known limits. The film is a feature based on a series of 11 Saturday Night Live sketches performed between 1977 and 1979 developed by Dan Aykroyd and featuring Aykroyd and Jane Curtin in the primary roles. 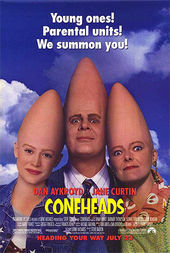 Its plot is similar to that of The Coneheads, an animated short created by Rankin/Bass in 1983 and featuring the voices of Aykroyd and Curtin. WE EVEN CARE ABOUT CONEHEADS' TITLES. KEEP US PUBLISHING, BECOME A PATRON.